Blue Lan watches over the 888 Market in Night Market Hero. The Skinny: Formulaic comedy-drama pushing Taiwan local pride and culture. The setting and characters are sometimes diverting and the idea is certainly a worthy one. However, as a film, Night Market Hero falls decidedly short. 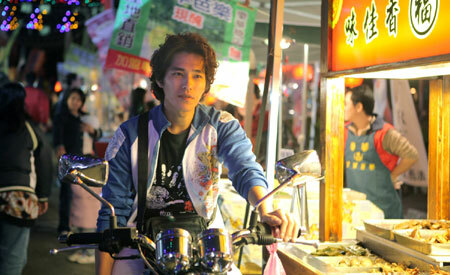 The best thing about Night Market Hero is that it’s about Taiwan. Beyond that, the positives are harder to qualify. A Lunar New Year megahit in its native Taiwan, Night Market Hero tells the tale of a Taiwanese night market, a bustling collection of stalls selling snacks, sundries and even some questionably legal goods. This particular market, the 888 Market, is home to an assortment of colorful but still recognizable characters. Ah Hua (drama star Blue Lan) is the young union leader, who keeps the plates spinning for all the locals, who have their differences but trust his just, sound leadership. But when redevelopment threatens the 888 Market, it may take more than good looks and a strong hand to assure that the market remains open for business. Night Market Hero has a predictable narrative, with soap opera subplots surrounding the 888 Market and its occupants, particularly Ah Hua and his love interest, photojournalist Yi-Nan (Alice Ke of Monga). Both have issues with family; Yi-Nan’s relationship with her dead father affects her choice of a current boyfriend, while Ah Hua’s former “uncle” and current politician Chang (Chu Ko-Liang) may have something to do with the planned redevelopment of the 888 Market’s real estate. The storylines are generic and needlessly complicate what should be a simple story: about cultural appreciation and locals looking to keep their livelihood. The film also tries to resolve too much by the end, with numerous subplots climaxing simultaneously via slow-motion melodrama and changes of heart from on-the-fence characters. Granted, this type of “for the people” story is hard to innovate, but the filmmakers seem content with cliché.